From the director of such direct-to-video macho "classics" as Death Race 3 and The Marine 2 comes supernatural western Dead in Tombstone. Stylized out the wazoo on a shoestring budget, this flashy trash is nearly clumsy and self-important enough to make for great unintentional comedy, but competent performances from Danny Trejo and Anthony Michael Hall occasionally spoil the derisive fun. Borrowing from, but slightly bettering, massive misfire Jonah Hex (which isn't saying much), Roel Reine's pet project uses the posed visual language of comic books and exaggerated gestures of pulp cinema to tell a blood-soaked tale of revenge. 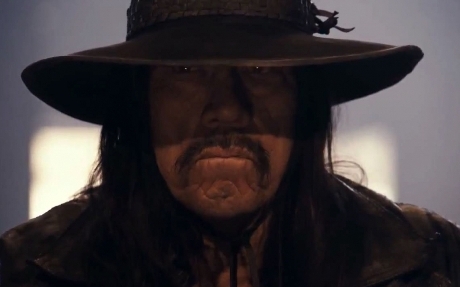 Danny Trejo plays Guerrero, the moral compass of an outlaw gang. When this noble thief takes umbrage with his partner's violent avarice following a big score, ringleader Red Cavanaugh (Hall) goads the rest of the gang into sending him on the lead express to hell. On the doorstep of the abyss, Guerrero cuts a deal with the devil (Mickey Rourke) to bring him the souls of his killers in exchange for another stab at life. Barrel-chested blacksmith Satan agrees, with the caveat of a 24-hour time limit to make good on Guerrero's vengeful promise. Above ground, Cavanaugh's gang has taken over the town of Tombstone and a revived Guerrero becomes the populace's unlikely avenging angel. For the film's only estrogen injection, Dina Meyer (Starship Troopers) lends the menacing antihero a hand as the no-nonsense daughter of the town sheriff. Nothing unexpected happens, but at least most of this mystical twist on the typical lone wolf western is easy on the eyes, in an arty beer commercial sort of way. Judging by comments made in the bonus content, the film's cinematography was by far Reine's chief interest. "The Leader of the Gang" is ostensibly about Reine's overall work as a director, but it's almost completely focused on his elaborate camera set-ups, while most of his feature commentary is spent talking about how he orchestrated various shots. Asides regarding Rourke's salary are amusing, though one has to wonder why nothing is mentioned about why his voice was clearly overdubbed in a number of scenes. "The Making Of" is composed of the usual self-congratulatory banter and behind-the-scenes footage, giving a general overview of how the project came together, while "Horses, Guns & Explosions" sheds additional light on the intensive stunt work and "A Town Transformed" details the efforts made to quickly ready the set (on a studio back lot in Romania) for various degrees of destruction.